KC Parent named Theatre for Young America’s current production of If You Give a Mouse a Cookie starring Noelia Rothery and Coleman Crenshaw one of it’s Top Picks for October. Laura Joffe Numeroff’s “If you…” popular Children’s Series keeps kids laughing. Fans of the series will love “If you Give a Mouse a Cookie” at Theatre for Young America. The show is full of good old-fashioned physical humor and slapstick. The creativity of the cast played out well and with each stunt the mouse pulled, the children roared with laughter. 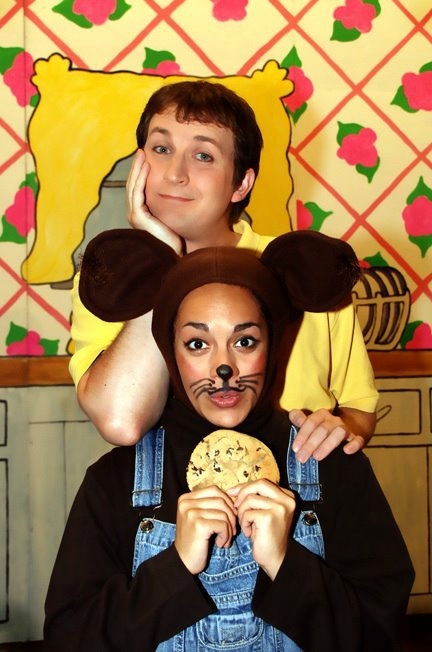 If you’re looking for fun entertainment for little ones this fall, consider an outing to TYA’s “If You Give a Mouse a Cookie.” We recommend this show for early elementary and preschool children. For the full review at KC Parent click here. If You Give a Mouse a Cookie runs through November 12th at the H&R Block City Stage on Level B of Union Station. Showtimes vary, but 10am Tuesdays-Fridays and 1pm on Saturdays will always get you there for a show. For tickets and showtimes visit Union Station Ticketing.